Manufactured by Stord International, one of Putsch® Group's partners, our twin screw presses are specially designed to ensure maximum liquids recovery for seafood processing industries. The new Screw Press L72-F has a nominal capacity of 60 tons of raw material per hour, and is our most powerful option available. 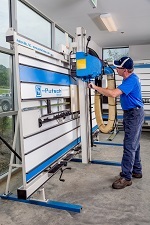 By design, vertical panel saws offer space-saving and safety benefits that cannot be matched by sliding panel saws, and we believe that Putsch® Group builds the best vertical panel saw on the market. Our SVP 133 Space Saver requires less than 60 square feet of floor space with its ultra-compact frame. It’s the perfect affordable option for any small workshop. Developed for the requirements of the sugar industry, the Putsch® Segment Filter combines the advantages of both candle filters and frame filters. The new flat filter segment design increases the filtration area, and new segment design allows for turbidity control and easy handling. The Putsch® Segment Filter comes with a proven two-step back flushing system for efficient cloth cleaning and high mud density.